For other people named Philip Carteret, see Philip Carteret (disambiguation). Philip Carteret, Seigneur of Trinity (22 January 1733, Trinity Manor, Jersey – 21 July 1796, Southampton) was a British naval officer and explorer who participated in two of the Royal Navy's circumnavigation expeditions in 1764–66 and 1766–69. Carteret entered the navy in 1747, serving aboard the Salisbury, and then under Captain John Byron from 1751 to 1755. Between 1757 and 1758 he was in the Guernsey on the Mediterranean Station. As a lieutenant in the Dolphin he accompanied Byron during his voyage of circumnavigation, from June 1764 to May 1766. In 1766 he was made a commander and given the command of HMS Swallow to circumnavigate the world, as consort to the Dolphin under the command of Samuel Wallis. 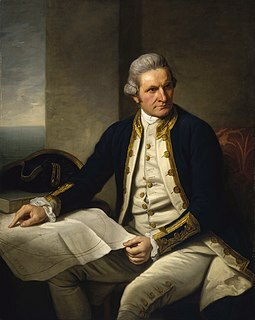 The two ships were parted shortly after sailing through the Strait of Magellan, Carteret discovering Pitcairn Island and the Carteret Islands, which were subsequently named after him. In 1767, he also discovered a new archipelago inside Saint George's Channel between New Ireland and New Britain Islands (Papua New Guinea) and named it Duke of York Islands, as well as rediscovered the Solomon Islands first sighted by the Spaniard Álvaro de Mendaña in 1568, and the Juan Fernández Islands first discovered by Juan Fernández in 1574. Weakened by severe illness, he arrived back in England, at Spithead, on 20 March 1769, having been ably assisted by Lieutenant Erasmus Gower who was, for much of the voyage, the only fit person on board Swallow who could navigate. a daughter, Elizabeth Mary (1774 – 21 September 1851, Yarmouth), in 1818 became the third wife of William Symonds, Surveyor of the Navy. His new ship, HMS Endymion, at last came on 1 August 1779 and despite problems in the Channel, off Senegal and off the Leeward Islands (at the last of which Carteret was nearly killed in a hurricane) he arrived in the West Indies as instructed. Despite having a share in four prize ships, he was paid off and the Endymion transferred to another captain. All his petitions for a new ship were unsuccessful and he suffered a stroke in 1792, retiring to Southampton in 1794 with the rank of rear admiral. He died there two years later and was buried in the catacombs of All Saints' Church, Southampton. In 1940 the church was destroyed by German bombing. In 1944 the bodies beneath it were reburied in Hollybrook Cemetery in Southampton. ^ "Carteret, Philip, Rear-Admiral". National Maritime Museum. Retrieved 16 December 2010. ^ Encyclopædia Britannica, vol. 4, p.263: "Duke of York Islands". Chicago, 1989. ISBN 0-85229-493-X. ^ Encyclopædia Britannica, vol. 25, p.254: "Pacific Islands". Chicago, 1989. ISBN 0-85229-493-X. ^ "Captain Mosses Account of the Islands of Juan Fernandez and Masa Fuero, in the Pacific Ocean – Royal Navy History". The Naval Chronicle. 18. 1807. Archived from the original on 22 July 2011. Retrieved 1 March 2010. ^ Bates, Ian M. (2017). Champion of the Quarterdeck: Admiral Sir Erasmus Gower (1742–1814). Sage Old Books. pp. 44–73. ISBN 9780958702126. ^ Wallis, Helen (1965). Carteret's voyage round the world, 1766–1769. Hakluyt Society. Wikimedia Commons has media related to Philip Carteret.